Maui is full of breathtaking wedding venues – from beautiful churches, white sandy beaches and dramatic cliffs, but the island also offers some really unique options for truly memorable weddings. 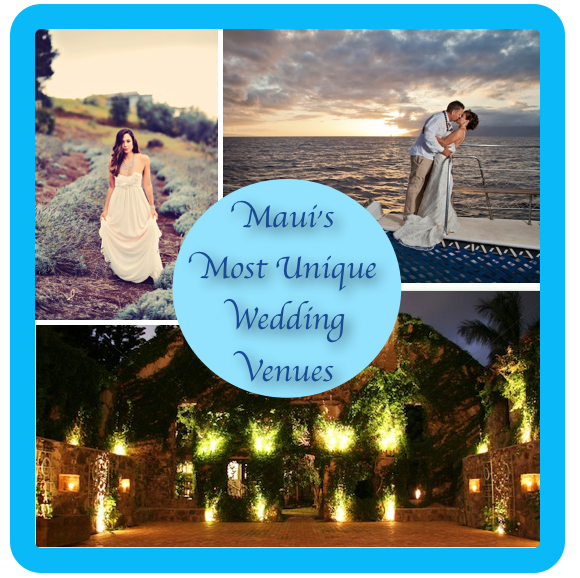 We’ve compiled the 5 Most Unique Wedding (and wedding-related) Venues on (and around) Maui. In 1861, Haiku Mill began its life as a sugar mill, only to be abandoned twenty years later, where it sat quietly, becoming part of the landscape, for the next one hundred years. The only remains of the initial structure, the stately stone walls, are now covered with vines and lush vegetation. The area has been lovingly restored, and entering the property is like stepping back in time. The Haiku Mill blends the stunning natural beauty of Hawaii with the Old World elegance of Europe. Conde Nast listed Haiku Mill as one of the top 25 wedding venues in the WORLD, one of only two listed in the USA. Haiku Mill is available for intimate parties to grand weddings, private events and photo shoots. Click here to see more. From rehearsal dinners, sunset ceremonies, or unique wedding receptions, Maui Ocean Center provides an under-the-sea setting in this central Maui location. The aquarium even offers underwater weddings in their Open Ocean exhibit, if bride and groom are SCUBA certified. Guests can witness the event in the comfort (and dryness!) of the 54′ long acrylic tunnel which runs through the exhibit, or the large floor to ceiling viewing window. Or, if you are looking for an out of-the-box proposal idea, how about an underwater one? One of the aquarium’s staff divers will carry a sign with a message for your special sweetie! Click here to see more. Ocean Vodka Farm and Distillery recently opened The Point, a private event space, 22,000 square foot grassy vista with unparalleled views of the north and south shore of Maui, surrounded by fields of organic sugar cane. Besides weddings and private events, Ocean Vodka offers tours and samplings at its 80 acre farm, located in lower Kula, near Surfing Goat Dairy. Click here to see more. Trilogy Weddings captures the essence of romance with their exclusive sailboat venues. Whether it is an intimate rehearsal dinner, private group snorkeling adventure (a pre- or post- destination wedding group activity!) or celebrating your ceremony and reception, a professional planner will ensure every detail of your important day is perfect. Click here to view more.